The term sweatshop was first used in the nineteenth century to describe sewing factories where the conditions were hot, crowded and airless—and the workers paid a pittance for 16-hour days. Public awareness of sweatshops is not new. New York’s Triangle Shirtwaist Factory Fire of 1913, which killed 146 workers, mostly young women, over half of them Jewish immigrants, sparked calls for reform. Exactly a century later, the Rana Plaza collapse in Bangladesh killed more than 1100 workers—and raised new calls for reform. Yet people still work long, underpaid hours in deplorable conditions in thousands of factories. People (predominantly women) who work in the global garment industry are often poor, young, uneducated and disenfranchised. Labor laws (and enforcement) can be lax. Workers are sometimes taken advantage of, discriminated against, denied the right to unionize, harassed, threatened and cheated. Working conditions can be unsafe and unhealthy. This is not to say that sewing is universally bad work or that all factories are sweatshops. For 200 years, garment sewing has been an entry-level occupation in industrializing countries, often providing local women their first independent income. 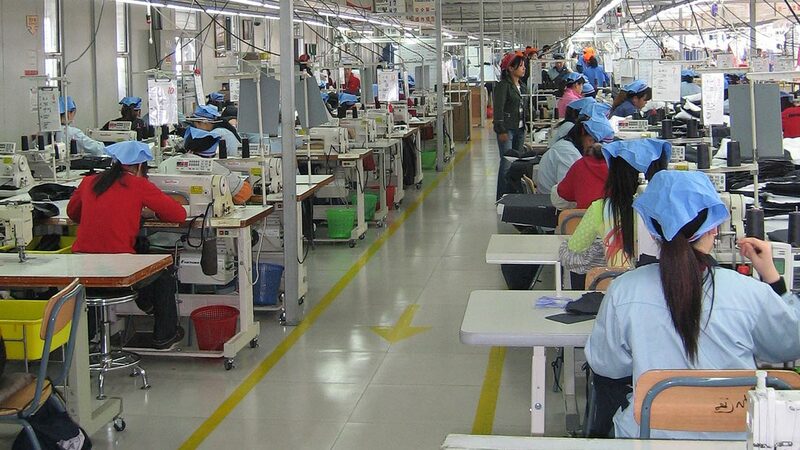 Many factories produce clothing under safe, healthy and humane working conditions and pay legal, if low, wages, but they are the exception rather than the rule. Our own employees—the nearly two thousand people who work directly for us in our offices, stores and distribution center—are paid fairly and enjoy good benefits, including generous health care, subsidized child care (in Ventura and Reno), flexible work schedules and paid time off for environmental internships. Many employees share our values, care about quality and are active in environmental and community causes. Turnover is in the single digits, and on average, we receive a couple hundred résumés each month. Like most clothing companies, we do not make our own products, nor do we own any of the factories that do. We design, test, market and sell Patagonia gear. These are our areas of strength. We pay other companies, who have the technical expertise and equipment, to produce the fabrics and do the actual cutting and sewing. This poses special challenges for us because we feel responsible for any work. When considering new factories, or evaluating current ones, we take a fourfold vetting approach—one that includes social and environmental practices equally with quality standards and business requirements like financial stability, adequate capacity and fair pricing. Our Social/Environmental Responsibility (SER) team can veto a decision to work with a new factory (as can, as always, our Quality team). This practice is rare in the apparel business and keeps us out of factories that don’t share our social and environmental values. We have also trained our Sourcing and Supply Planning teams in responsible purchasing practices to minimize negative impact on the factory workers and the environment that could result from our own business decisions. Our sourcing and quality staff work closely with our SER team and hold a joint weekly meeting to make supply chain decisions. We have three big projects in progress. 1) We are working within the industry to help make the living-wage principle a concrete reality for garment workers. To this end, we are expanding our Fair Trade Certified™ program, for which Patagonia pays an additional premium directly to the workers in participating factories that can be used as a bonus to either increase wages or for a community development project. Fair Trade Certified products will represent a significant portion of the line and produce tangible, measurable benefits for workers by fall 2015. We consider the Fair Trade program to be the first step in our commitment to paying garment workers a living wage. We are also a part of the Fair Labor Association’s fair compensation project, in which member brands and suppliers will pilot and implement living-wage models in the supply chain. 2) We are intensifying our efforts to improve labor conditions in the supply chain beyond the cut-and-sew factories (the textile mills, dye houses, etc.). We have taken significant steps in an effort to stop human trafficking in fabric mills in Taiwan that supply Patagonia. We have reached agreements with our suppliers to repay to migrant workers recruitment fees higher than allowed by law and to discontinue entirely the practice of charging (or allowing labor brokers to charge) migrant workers recruitment fees, effective June 2015. 3) In a proactive effort to encourage and strengthen our factories’ ability to manage fire safety, we joined and seed funded the Fair Labor Association’s Fire Safety Initiative in 2013. This global program trains workers and factory management to actively promote fire safety, and recognize hazards and eliminate them without delay or seeking management approval. We are currently scaling the training to the rest of our factories. We try to work with factories that share our values of quality and integrity. Our belief is that “you can’t make good products in a bad factory.” We work with clean, well-run factories that have skilled, experienced workers and a low turnover rate. As we grow we recognize the need to test these assumptions and begin to formalize our contractor review process. In 1990 we ask our contract managers and Quality team to begin reviewing the factories they visit, both for product quality and working conditions. We make the decision not to work with any factory we can’t visit. We unveil a “contractor relationship assessment” at our first supplier conference, to which we invite representatives from every factory we work with. The assessment is a scorecard kept with each factory to rate its performance in different areas. We ask factory managers to do the same. If we give a factory a low mark in one area and the factory scores itself high, the difference becomes the subject of conversation and focus. Our approach is informal, but our demands for high quality largely keep us on the responsible side of social compliance. We begin contracting with third-party auditors to visit and assess potential new factories. Though audits are but a snapshot in time, they do give an idea of a factory’s work conditions and management systems. They’re also a good way to initiate discussions about change. A human-rights organization reveals that Wal-Mart sells Kathie Lee Gifford clothing made under license by a Honduran sweatshop employing 13- and 14-year-old girls who work 20-hour days for 31 cents an hour. The work originally had been contracted to a reputable U.S. manufacturer. But to meet strong sales demand, that factory subcontracted the work to another business that in turn subcontracted to the Honduran factory. After a public outcry, Kathie Lee Gifford, to her credit, joined the anti-sweatshop movement. Both Gifford and Patagonia were invited to take part in President Clinton’s “No Sweat Initiative.” As a result of what we learned, we created a more formal process for our company and became founding members of the Fair Labor Association (FLA), an independent multi-stakeholder verification and training organization that audits our factories. After these several steps forward, we take a step back when we begin sourcing products in new factories that can produce them at a lower cost. The number of factories we work with balloons, and some of these subcontract work to other factories we know nothing about. We lose track of whom we do business with and what working conditions are like in many of our factories. For a while we drop out of the FLA.
We hire a manager of social responsibility to monitor social compliance throughout our supply chain and begin to work again with the FLA. We educate Patagonia employees about factory workplace issues to help them understand how their own actions can unwittingly cause factory workers to suffer longer workweeks, hurry-up pressure and greater stress. We expand our brand collaboration efforts in auditing, special engagements (with local third-party experts to help solve specific problems within a factory), and information sharing. Three of our cut-and-sew suppliers (with a total of eight factories) are now FLA members (and thus are held to the same high membership standards Patagonia must meet). We work more closely with our factories and become more familiar with their supply chain. To strengthen individual relationships and increase transparency within our supply chain, we reduce the number of primary factories we work with by 50 percent. We launch The Footprint Chronicles®, which traces the social and environmental impact of our products. We ask Verité, an international nonprofit social auditing, training and capacity-building organization, to train the 75 employees who visit our suppliers’ factories to fully understand Patagonia’s Workplace Code of Conduct. We conduct internal refresher sessions annually for both new and seasoned employees. We elevate the Social Responsibility Manager position to a high-level Director of Social and Environmental Responsibility. This integrates social and environmental work at the factory level. We identify all subcontractors and now audit close to 100 percent of our cut-and-sew factories, including subcontractor locations. We begin auditing raw-materials suppliers in December. We implement a new, cutting-edge human-trafficking detection tool. We hold our first internal training on human trafficking in the supply chain to all of our product supply chain staff. We launch our California Transparency in Supply Chains disclosure late in 2011. We launch our formalized Responsible Purchasing Practices per Fair Labor Association requirements of our Sourcing team. Our audits of raw-materials suppliers reveal that labor brokers charge migrant workers from Asian countries up to $7,000 to get a job in Taiwanese fabric mills that supply Patagonia. We identify the audit results as red flags for human trafficking. The practice is considered an acceptable part of doing business by our suppliers, though brokers regularly charge above legal limits. Transportation, work visas and other essentials are included. But paying that kind of money for a factory job is an almost impossible burden for workers already struggling to make a living. In an effort to understand the social and environmental impacts of our supply chain, we launch a revised and even more transparent Footprint Chronicles website. Early in the year, we strengthen our Code of Conduct, which outlines responsible practices for our supply chain, to include a living-wage component and implement policies to consider the living-wage rate in our costing formulas. These efforts are part of short-, medium- and long-term strategies to address living wages in our supply chain. We begin to execute our short, medium and long-term strategy to eradicate human trafficking in Taiwan. We host a one-day brand forum in San Francisco to which we invite some 40 brands to talk about human trafficking in the supply chain. Partnering with Verité, an NGO dedicated to ensuring people around the world work under safe, fair and legal conditions–we conduct in-depth migrant worker assessments with four of our suppliers in Taiwan. We set out to develop a new standard, institute changes in our supply chain, repay current workers, and share our recommended standards with other companies that want to eradicate similar practices by their suppliers. In May we begin selling Fair Trade Certified™ apparel. We start small with ten women’s sportswear styles sewn in three factories in India owned by Pratibha Syntex. As of spring 2015, we offer 33 styles–21 made in a Fair Trade Certified sewing facility and 12 made with Fair Trade Certified cotton. For every Fair Trade Certified item produced for Patagonia, we pay a community-development premium. The money goes into an account controlled by the cooperative of farmers or association of factory workers who decide how best to use it. The funds are designated for social, economic and environmental development projects. For example, cotton farmers may choose to use the money for agricultural improvements, rainwater catchment systems or to build a school or a health clinic. Workers in Fair Trade factories may invest in healthcare for their children, bicycles for easier transit to and from work or a cash bonus that can get them closer to a living wage. All workers in the factories and farms that make our Fair Trade Certified clothing benefit from the funds, whether they work directly on Patagonia products or not. We are invited to present our work on human trafficking to the White House Forum on Combating Human Trafficking in Supply Chains, led by Secretary of State John Kerry. We require our suppliers in Taiwan to stop charging labor-broker fees for foreign workers hired after June 1. We also mandate that currently employed workers be repaid fees that exceeded the legal amount. Our factory partners commit to partnering with us to eliminate human rights issues in our supply chain and we are pleased to see their strong overall commitment to doing right by their workers. Representatives of Taiwan’s Ministry of Labor Workforce Development Agency now provide training to our suppliers on the practice of direct hiring. And, because this form of human trafficking is not confined to the island of Taiwan, we apply our new migrant worker standard to our entire tier 1 (mill level) supply chain (but have not found the same issues outside Taiwan). We also make the standard publicly available to any company that would like to adopt it.